Oracle has announced retirement of Oracle Application Implementation Method (AIM) and anyother implementation methodologies as of January 31, 2011. Oracle Unified Method (OUM) is the single implementation methodology designed to be used for ALL Oracle product implementations. 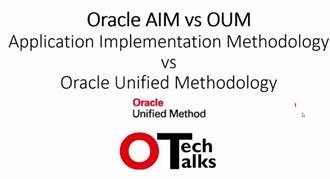 Oracle Unified Methodology (OUM) – A video tutorial on Oracle Unified Method (OUM) vs Application Implementation Methodology (AIM) This includes definition of OUM, OUM focus areas, implement views like Requirements-Driven Application Implementation or Solution-Driven Application Implementation and OUM Documents equal to AIM documents lik RD050(Gather business requirement), TE040(Test Scripts), BP080(Future Business Model), BR100(Define Application Setup). Watch the video here.